TheWirk.com ~ voted BallHyped.com's 2010 "Best Independent Sports Blog": Tonight I saw the Bobcats defeat the Timberwolves ~ Can you say that? Tonight I saw the Bobcats defeat the Timberwolves ~ Can you say that? 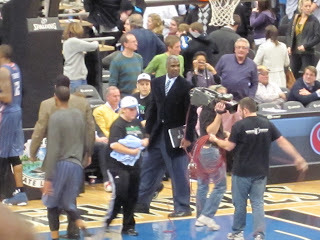 Tonight, I went to the Target Center to watch the Charlotte Bobcats v Minnesota Timberwolves' game. Not expecting much of anything out of tonight's match-up I walked over a few minutes before the game started and found a guy on the street with a ticket. I don't carry $10s, and it's cold outside in Minneapolis. I flipped him $20 for a $35 ticket and made it to my seat just in time for the opening tip. The only reason I was interested in this game is because Charles Oakley is now an assistant coach for the Bobcats. Paul Silas definitely has his work cut out with this squad, but they were able to defeat the Timberwolves tonight so who knows what that team can do. To be fair, this game was sloppy and there was very little energy in the arena. Can you say booooooooooring? There are 82 games in the NBA regular season, and it seemed that the Timberwolves were going to take the night off. Kevin Love and Michael Beasley did their best to spur their teammates on, but the Timberwolves' late push wasn't enough. At one point during the first half, the crowd started to boo the team. 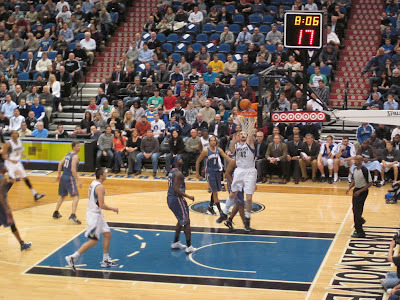 The Timberwolves were losing to the Bobcats and the crowd was not pleased. At around the same time, there was an announcement for the season ticket holders to check their mailboxes and renew. Seriously?!?! Scoreboard, people. Scoreboard. After getting some ice cream at half-time, I asked the guy next to me if I could take a look at his booklet (i.e. pre-game program). Yep, sure enough I was watching Kwame Brown and Darko Milicic go against each other. **** Honestly, I think my ice cream is more interesting, but since this blog isn't about ice cream, I'll try to focus on the game. There really isn't much to say. Sure the game went into overtime, but for my $20 and the level of effort I saw on the floor ~ I just don't have the desire to look at a box score and write anything intelligent or snarky. Tonight, for $20, I watched the Charlotte Bobcats win. My friends say that I overpaid. Regardless, I was there. Can you say that?!?! 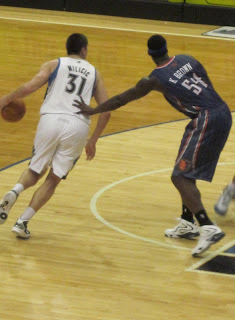 Poor Kwame Brown - the Jamarcuus Russell of the NBA. I just looked up Jamarcus Russell's stats... Ouch! Happy New Year to you too, Jacob!